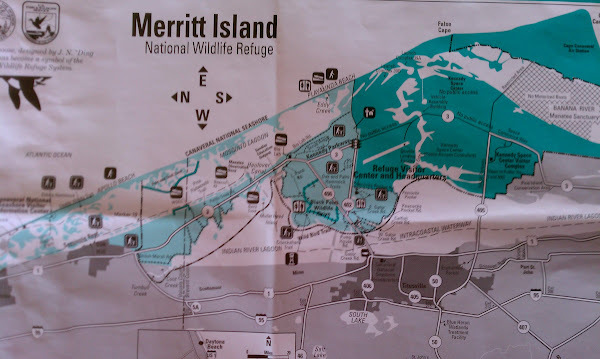 On Wednesday after going to the Kennedy Space Center Astronaut Hall of Fame, we decided to take a drive to the Merritt Island National Wildlife Refuge. 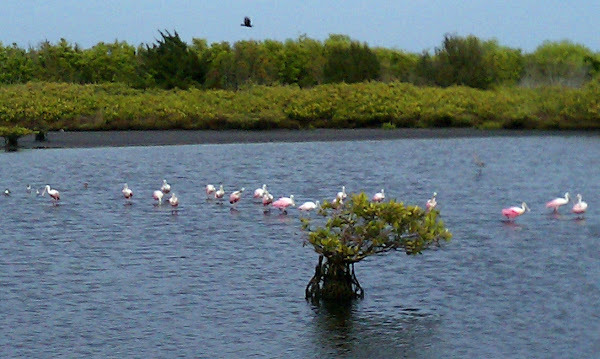 The refuge is contained within a 35-mile barrier island and has over 500 different species of wildlife and 1000 species of plants. The refuge is strategically located on the Atlantic Flyway, a major bird migration corridor and is a resting place for many migrating birds. According to the weather forecasters, it was supposed to be a somewhat wet day but when we headed out on our drive, it was just sprinkling a bit. 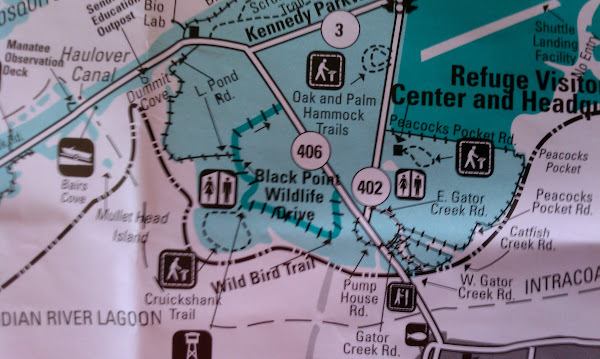 After driving a few miles, we stopped at the Visitor Center to pick up a map and to find out where the best areas were for wildlife viewing. 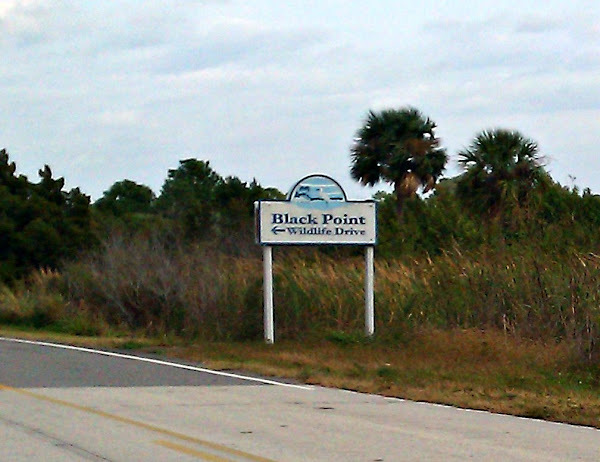 We were told that the 7 mile long Black Point Wildlife Drive would be the best. 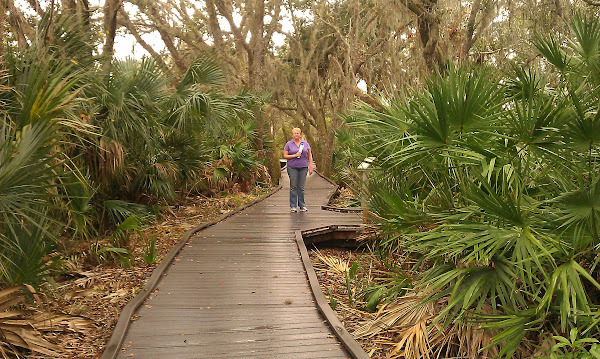 Before going back to the van, we decided to walk along the 1/4 mile boardwalk next to the Visitor Center. Of course, just as we starte d out, it began to rain. Oh well, nothing like a quick run in the rain! There is a $5 entrance fee but there is nobody there to collect it – it is strictly an honor system. However, it is free to holders of a National Park Service Senior Pass so we didn’t have to pay anything. The road was a one lane, one way, well maintained packed sand road with a 15 mph speed limit. 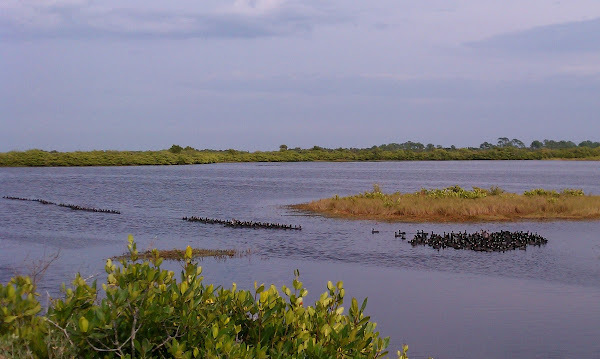 As we drove along, we saw lots of birds that we recognized – blue herons, white ibis, and egrets. One of the rangers at the visitor center told us we w ould see lots of coots and boy did we ever! We must have seen thousands (well, maybe hundreds) of them. With black bodies and white chicken like beaks they are somewhat comical to watch. 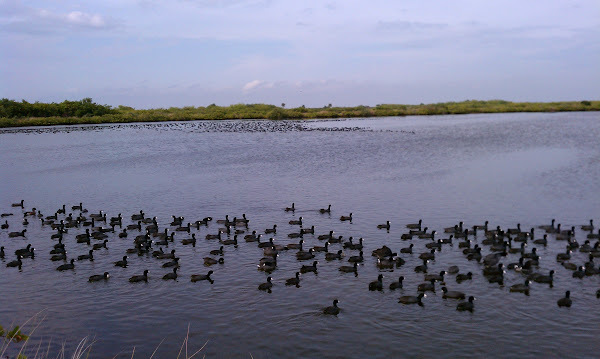 We were told later in the day by one of the National Park volunteers that a group of coots is called a rack and that these birds were migrating. Overhead we saw a flock of pink and white birds which we initially thought might be flamingos but then on a sign we saw these were Spoonbill Roseate. Similar to the flamingo, it gets its pink color from the food that it eats. 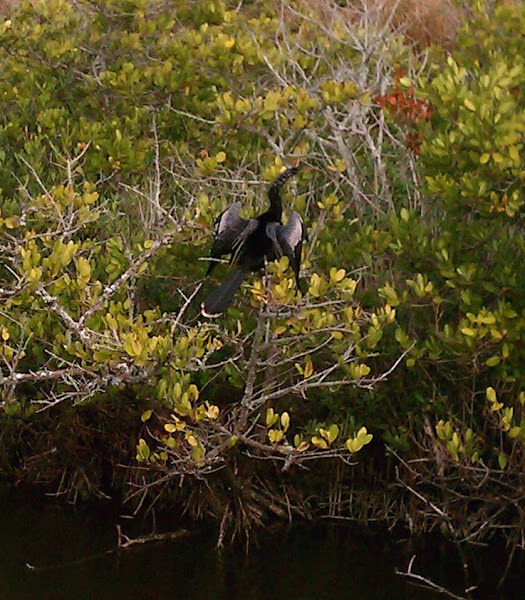 Later we saw an Anhinga sunning itself in a bush. 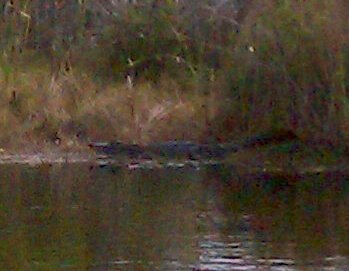 As we drove further along, we saw several alligators sunning themselves along the banks. Since they were far away it was difficult getting a good picture of them. The best part of the entire drive though was the bald eagle’s nest with two baby eagles. Three volunteer from the National Park Service had special spotting scopes set up so you could see the nest. 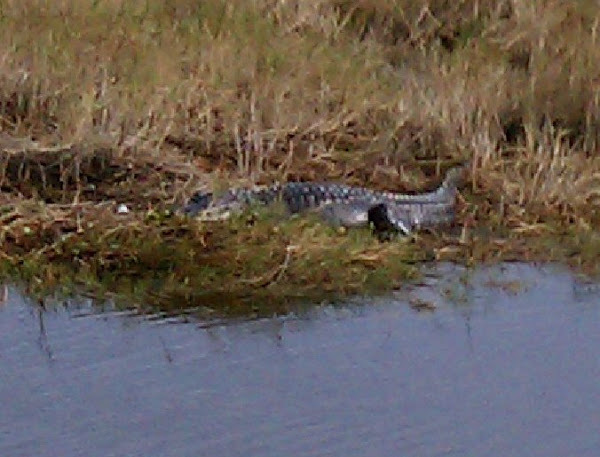 The nest was about 7 feet wide and is reused each year by the same pair. The babies were about 3 weeks old and would stay in the nest until they were about 10-12 weeks old when they would start to fly and learn how to hunt from mom and dad. While we were watching, the mother (or maybe it was the father) flew into the nest. Luckily we were the only ones there at the time so we could watch the babies being fed for as long as we wanted. We must have stayed there for well over a half hour chatting with the volunteers. Unfortunately, the nest was too far away so we couldn’t take any pictures! After that, we continued on the drive but we were only a short distance from the main road so there wasn’t a lot more to see. About 10 miles from the Visitor Center, there is also a manatee viewing area but we didn’t go there – since the waters are cold, there aren’t any manatees in the area at this time of year. Maybe next time. We would definitely recommend exploring this island to anyone who is in the area. 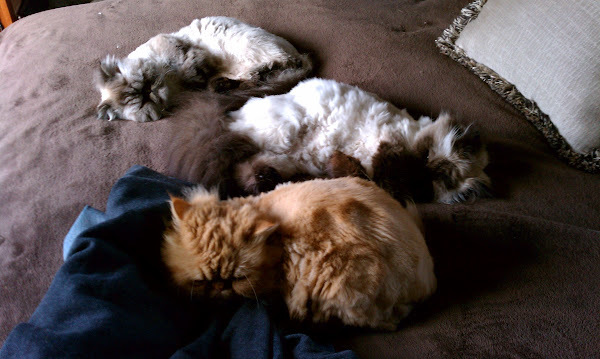 Back home we found more wildlife pretty exhausted from their day!